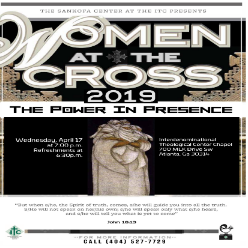 2019 Women at the Cross - "The Power in Presence"
As a programmatic component of "Souls of Black Girls," a trans-generational action and education platform that highlights the lives of Black girls and women, The Women at the Cross Worship Performing Arts Worship Service (WATC) will take place on April 17, 2019 at 7:00 pm in the Chapel on the campus of the Interdenominational Theological Center. The "Women at the Cross" worship service connects artistic liturgy and worship to re-shaping our consciousness about the unjust realties their faced by Black women and yet, uncompromising role in the majesty, beauty and glory of God's presence in the world. As a programmatic component of "Souls of Black Girls," a trans-generational action and education platform that highlights the lives of Black girls and women, The Women at the Cross Worship Performing Arts Worship Service (WATC) will take place on April 17, 2019 at 7:00 pm in the Chapel on the campus of the Interdenominational Theological Center. The "Women at the Cross" worship service connects artistic liturgy and worship to re-shaping our consciousness about the unjust realties their faced by Black women and yet, uncompromising role in the majesty, beauty and glory of God's presence in the world.